This is a real favourite of mine! Teriyaki is made up of the words ‘teri’ meaning ‘lustre’ and ‘yaki’ meaning ‘grilled’ or ‘cooked’. 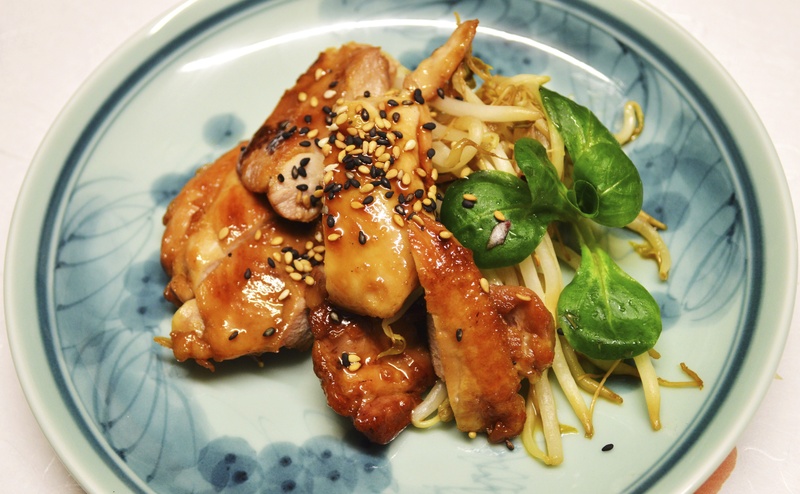 Here’s a quick and easy recipe for making chicken teriyaki in the frying pan. The sauce is also a perfect match with salmon or tofu or you can use it to give a flavour boost to a noodle stir-fry. Serve it with rice and veg for a healthy but satisfying meal. Combine sauce ingredients in little saucepan. Bring sauce ingredients to boil, turn down and simmer for a couple of mins to thicken. Heat frying pan, no need for oil. When hot, put in chicken thighs. Sear on each side until golden. Turn down heat to medium-low and cook for about 5 mins, turning chicken over halfway. Add teriyaki sauce for final min. Remove chicken from frying pan and leave to rest on kitchen board for 2 mins. Keep excess sauce. Slice chicken into smaller pieces and serve with rice and veg and pour over extra sauce. Visit https://www.youtube.com/watch?v=ojBYcBRwzmw&feature=youtu.be for the video!